Regardless the time of the year, my family loves pumpkin pie. 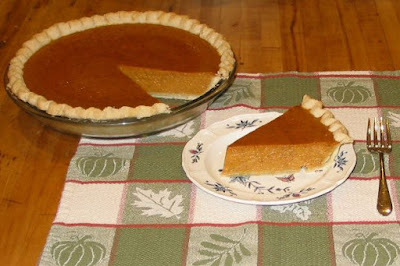 Of course, when pumpkin is out of season, I am reduced to using pumpkin puree from a can, but fresh pumpkin makes the very best pies. Boil pumpkin for 10 minutes, or just until tender. Drain water, mash pumpkin, and set aside to cool. Whisk the eggs , brown sugar and honey in a large mixing bowl. Add cooled pumpkin, cream, and spices. Mix thoroughly. Pour filling into an unbaked 9” pie shell and smooth surface with the back of the spoon. Bake at 350 degrees for 40 minutes or until set. Allow to cool. Serve with ice cream or whipped topping, if desired. Do you like to bake pumpkin pies year-round, too?